"Still Yelling. Still Fighting. Still Ready for Love." Grumpier Old Men is an American romantic comedy about two long-time frenemies whose grown children are about to get married. The movie is a sequel to the original Grumpy Old Men. It's fall in Wabasha, Minnesota, and Max Goldman (Walter Matthau) and John Gustafson (Jack Lemmon) are no longer feuding. John is happily married to his new bride Ariel (Ann Margret) while taking care of his aging father (Burgess Meredith). Meanwhile, Max is busy with preparations for the wedding of his son Jacob (Kevin Pollack) to Gustafson's daughter Melanie (Daryl Hannah). Despite this, both men are distracted by two events. One is the annual attempt at catching Catfish Hunter, the largest catfish in Wabasha's lake. The second item is the transformation of the bait shop into an Italian restaurant by Maria Ragetti (Sophia Loren). Seeing this as an injustice to the bait shop, John and Max pair up to sabotage Maria's opening. However, Max starts to fall for Maria at the same time. Unfortunately, everyone's plans begin to unravel. First, John's father suddenly passes away. Next, Max's wedding plans fall apart, causing an argument and separation between Jacob and Melanie. The final straw is when Max thinks John is having an affair with Maria. Without asking for an explanation, Max breaks the fragile truce the two men have, resulting to a return to their feuding ways. Cooler heads eventually prevail, and the wedding goes as planned. However, not without Max making one last attempt to nab Catfish Hunter. Grumpier Old Men was written by Mark Steven Johnson, produced by John Davis and Richard C. Berman, and directed by Howard Deutch. It was released in the United States by Warner Brothers and ran for 101 minutes. 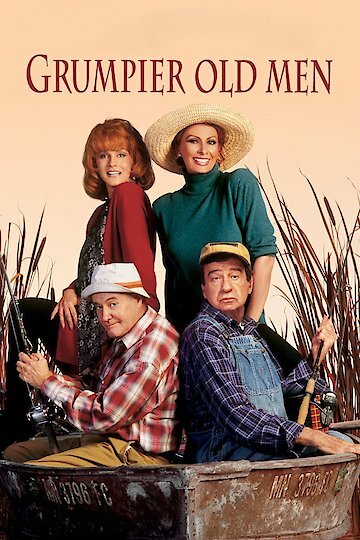 Grumpier Old Men premiered in December of 1995 with a rating of PG-13. Grumpier Old Men is currently available to watch and stream, buy on demand at Amazon, Vudu, Google Play, FandangoNow, iTunes, YouTube VOD online.